I thought this would be useful for others as it's a good study in how to design an app for easy 'onboarding' and sign up. 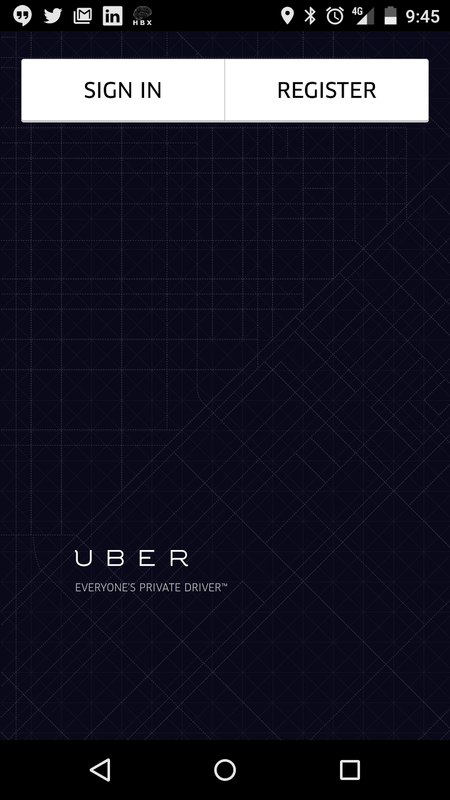 During a UX workshop I went through an app onboarding example using Uber. It is not an app I have used previously as I haven't had any need to use Uber. But everyone who has used it seems to love the service and convenience. And one of the guys told us how good it was so that was going to be our benchmark. 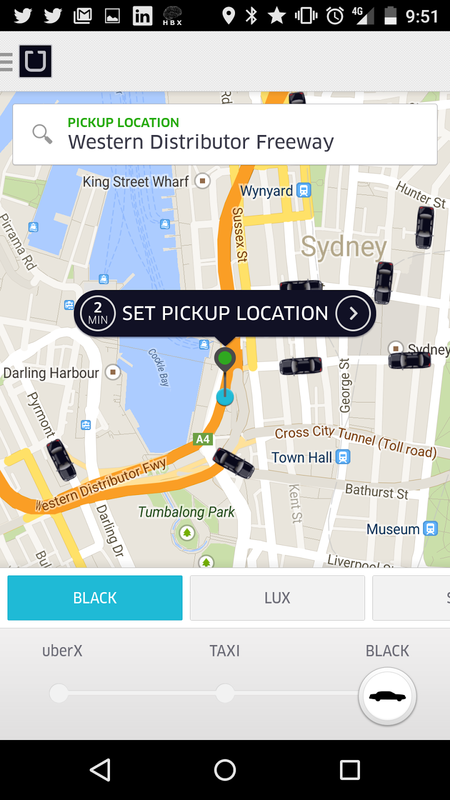 Uber was deemed an easy process and utilised some interesting phone features to make it as easy as possible. 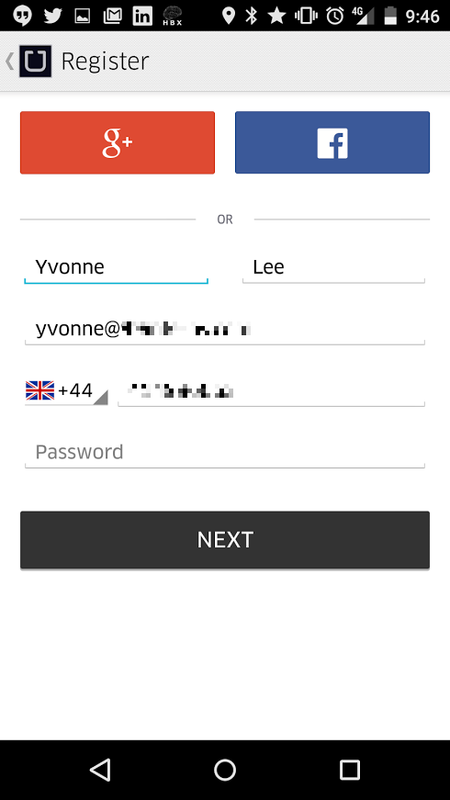 Takeaway: All apps should make onboarding (signups) as simple as possible and reduce keyboard entry of data. This study was done on an Android device (Nexus 5) on Thursday 26 February 2015 in the Sydney CBD area. This option allowed for social sign in. This is always a good option but don’t make this your sole way of signup as it can alienate people too. Also note that this picked up automatically my name, my email address and my country code (I do have a setting in there somewhere that makes it a UK phone). I selected the Google+ option and it prompted me for which account (no screenshot as that is standard functionality). 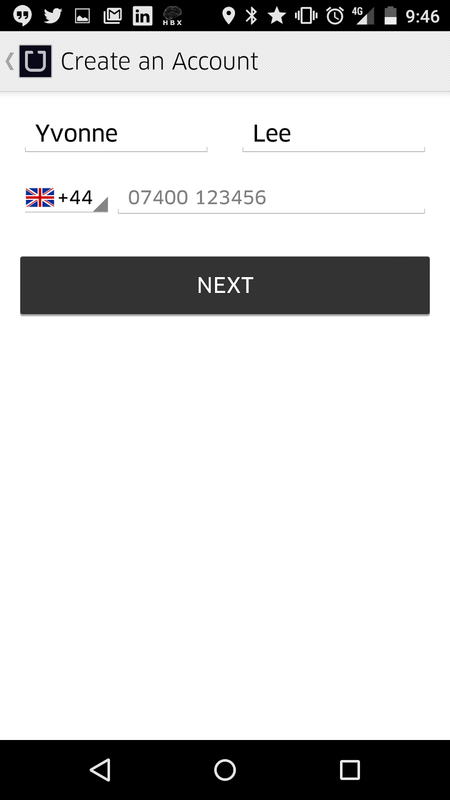 To create an account with Uber requires a phone number – this hasn't been passed through via the Google social sign in so the app prompts me to enter it in again. The keyboard that appears is the keypad only. 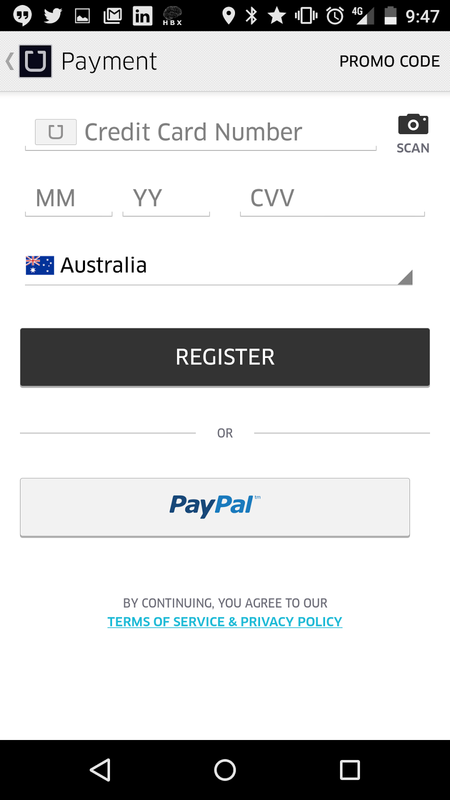 The next part of the registration requires a credit card to be entered or linkage to a Paypal account. Again having a couple of options increases the signup process. 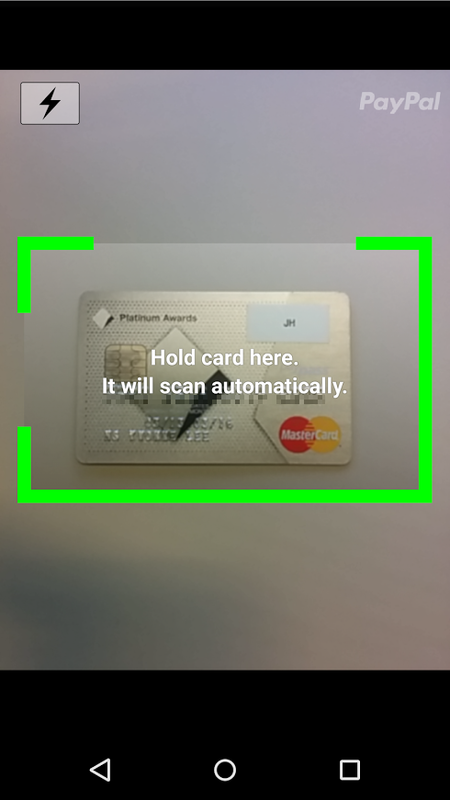 Using OCR , the card can be scanned and the numbers from the credit card can be picked up. Unfortunately this time it didn’t work (probably because it was a silver card with silver writing). Note: The green border and the white text is part of the app. I've used this type of functionality in the past and it's been fine so suspect it's just a card/camera issue (phone functionality not app functionality). The user is signed in at this point and doesn’t have to jump through any more hoops. This happens when the sign up happens on the device. 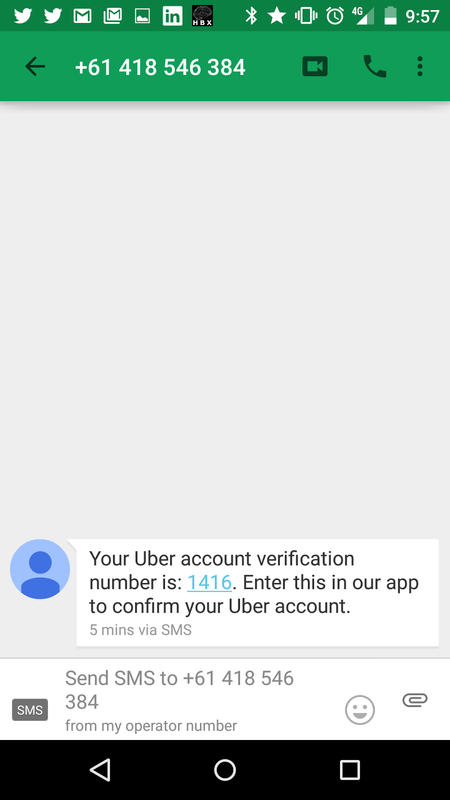 I’ll assume this text message that is sent from Uber is for signups that happen that can’t be verified via the device. I really liked doing this exercise. It was for work purposes as otherwise I don't think I could be bothered documenting each step!